There are direct flights to Paris from just about every country in the world. If you are coming from the USA of course the easiest way to get to Paris is to fly from whatever city is closest to you that has flights to Paris. Most likely are New York, Washington, Atlanta, Charlotte, Chicago, Los Angeles and you probably get the idea. For those of you who don't know the rules of the game here is how it generally works if you are looking for cheap fares. Airlines break up seats on a particular flight by price. Let's say there are 250 seats on a plane in the economy section. Maybe forty of those seats will be offered at the lowest price. When they are gone the next forty will be at a price slightly higher. When these are gone then the next group is slightly higher until you get to the last group of tickets, generally the biggest and most expensive. So in other words to get the cheapest seats you have to book early. But it is not so simple. Because maybe on a flight for April 21st the only tickets left are the most expensive, but April 22nd there are three cheap tickets left. But how will you know this unless you check every date? This is where an agent who specializes in cheap flights can help. Try www.agreatfare.com and usually they can find something inexpensive. There are also certain periods when airlines are short on cash and offer bargains. You will probably arrive at either Charles De Gaulle or Orly Airport, both of which are about 45 minutes from the center of Paris unless there is traffic. If nobody is meeting you the easiest way to get into the city is by taxi which will cost a little under 25 euros from Orly and around 50 euros from De Gaulle. There are usually plenty of cabs. The rates go up 30% between 7pm and 6am and there is a charge of 1.50 euros per suitcase. For between 100 and 200 euros you can hire a private car or limo. When it is time to leave Paris just have your hotel concierge call for a taxi or if you liked the driver that brought you into town ask for his card. You can also book a pre-arranged transfer which start at about 20 euros for a shuttle, or a private limo for a bit more. There are several bus lines from Charles De Gaul to central Paris but your best bet if you choose mass transit is the train which leave every 15 minutes between 5:30 am and midnight from the airport station to Gare du Nord, Chatelet Les Halles and Luxembourg stations. From Orly a shuttlebus will take you to the train which leaves every 15 minutes between 5:30am and 11pm to Gare d'Austerlits, St Michel/Notre Dame and Invalides stations. Air France provides bus service to and from both airports. From CDG the cheapest and easiest way to and from center is the Roissy Bus service which costs 8 euros each way (buy tickets from the driver) and drops you off and picks you up right across the street from the Opera where there is a metro stop if you need to continue. There are often Taxis hanging around this area to pick up people who need to get home or to hotels and don't want to lug bags down the metro steps. If you are flying on Ryan-Air then you will most likely be using Beauvis Tille Airport which is connected to the Porte Maillot by bus. Trains: There are 6 different train stations in Paris so where you arrive will depend upon where you are coming from just as where you leave will depend on where you are going. If you are coming from or going to Luxembourg, Switzerland, Austria, Hungary, southern Germany and eastern France you will use the Gare de l'Est. If you are coming from or going to Spain, Portugal and Southwest France you will use the Gare d'Austerlitz. 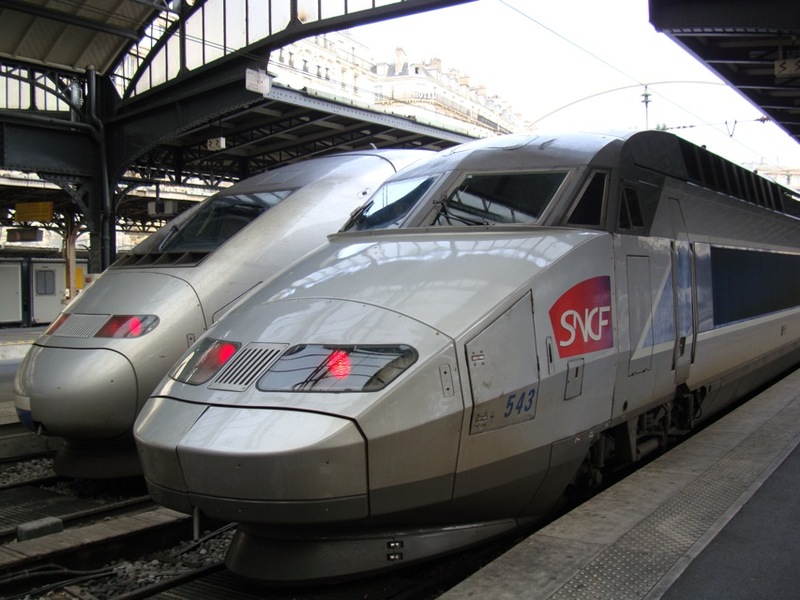 To and from Switzerland, Italy and Greece as well as south and southeastern France you will use the Gare de Lyon. The Gare Montparnasse is for western France, Chartres and Britanny while Gare St Lazare is for northwest France, Normandy and le Havre. Gare du Nord is for Belgium, the Netherlands, Scandinavia, Poland, Russia, northern Germany and the UK. The Eurostar trains which go to and from London in 3 hours through the Chunnel also use this station. It seems complicated but unless you are going to or coming from Switzerland you only have to remember the name of one station and they can all be found on any map of Paris. They are also all connected to the Paris Metro. Long Distance Bus: The buses from other cities on Europe arrive at the Gare Routiere Internateionale in Bagnolet a suburb east of central Paris, which is connected by Metro at Gallieni station on Line 3. No matter how long your journey was and how tired you are, you will probably be rejuvanated as soon as you get into the city and will just want to leave your bags in your hotel room and head for the nearest cafe. Don't worry. This is normal and you should follow your instincts.